In 2018, Aberdeen Harbour has been a hive of decommissioning activity. Nearly 10,000 tonnes of material have crossed the quayside, from projects such as the Maersk Leadon and Janice, Shell’s Brent Alpha projects and Nexen’s Plug and Abandonment programme. 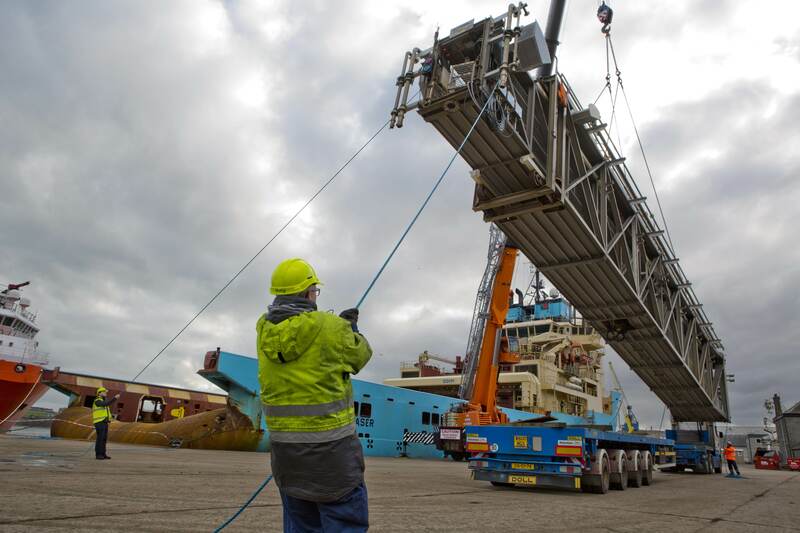 The impressive Maersk Inventor has become a frequent visitor to the port, making six port calls in the second half of the year. The near-15,000 tonne, 137m long vessel has safely offloaded a range of structures including 48 tonne subsea Christmas Trees, 32 tonne manifolds and ballast blocks, weighing 136 tonnes. “Our extensive, established supply chain, with its oil and gas expertise and capabilities, makes our port the natural choice for increased decommissioning activity,” commented John McGuigan, Operations Manager at the port. Customers benefit from the port’s suite of service providers, metal disposal services are supplemented by NORM waste management services, and shipping connections to scrap processors are well established. The location of Scotoil within the harbour means decommissioning operations are fully compliant with environmental procedures and regulations. The substantial increase in scale at South Harbour will secure the harbour’s ability to support significant heavy lift projects. The South Harbour will allow vessels of up to 300m to berth alongside, with a 6,000 tonne transfer load. The recently-arrived concrete caissons – weighing approximately 6,000 tonnes each – has reinforced the unique proposition South Harbour gives customers with project work on their minds. These caissons are the building blocks for the quaysides which, with state-of-the-art drainage systems and interceptors, will allow the segregation of working quays into independent, dedicated zones. This revolutionary, modular system will allow customers to ‘lock-down’ their activities in a physical and regulatory sense, while allowing them to define the size of the working area they require, bringing natural cost savings and efficiencies to their shoreside operations. The 125,000m² of laydown area can be split into 14 separate zones, each with varying heavy lift capacity, ranging from five tonne/m² up to 15 tonnes/m². A transfer capability of more than 6,000 tonnes will enable a large proportion of decommissioning material to be brought to the quayside. The opening of Aberdeen South Harbour in 2020 will transform our capabilities, and we look forward to supporting more customers in the decommissioning sector.